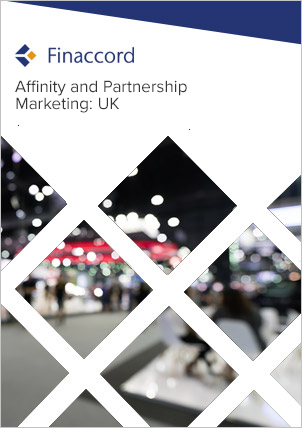 Finaccord's report titled Affinity and Partnership Marketing in UK Commercial Non-Life Insurance is an updated and expanded study of insurance partnerships in place with commercial affinity groups in the UK. It is based on a survey of 1,280 actual and potential partners across eight categories, namely: banks and building societies; lifestyle organisations; online aggregators and brokers; professional associations; sports organisations; trade associations; trade unions; and others. The analysis of partnerships in commercial non-life insurance has been taken to an unprecedented level of depth by splitting out partnerships for five distinct insurance lines: commercial liability; commercial motor; commercial property; commercial specialised (e.g. event cancellation, legal expenses, trade credit); and professional indemnity. The PartnerBASE™ database that accompanies the report details more than 1,400 externally-organised affinity schemes for commercial non-life insurance identified by Finaccord, recording the operating models and partners used in each instance. Together, the report and database together will provide you with the definitive guide to current and future opportunities in affinity and partnership marketing of commercial non-life insurance in the UK. most commercial affinity schemes are organised through a broker with over 200 mentioned in conjunction with at least one initiative – in contrast, where final underwriters were identifiable, over 50 are involved in at least one program. Finaccord's survey of 1,280 actual and potential partner organisations in the UK was carried out between March and May 2015.